We have the privilege of working with the best clients from all over the world. Check here what they said about us and our services and be sure to contact us! Villa Silver Split was superb in every way. This was our first visit to Croatia and staying in the Villa made it deeply memorable. It is beautifully designed, comfortable, luxurious, with facilities of a very high standard. The views were lovely and the location ideal – 15 minute walk into Split, and about 20 minutes up into the forest. The agency – Zdravka in the office and Tea who looks after the Villa – were wonderful: nothing was too much trouble. Tea helped us to organize trips, found us a wonderful driver (Goran) and when my son got an eye infection Tea got us a clinic for him, and Goran didn’t just take us there, he translated too! We were in good hands. We were so, so, so happy to have stayed at Villa Silver. Our only regret is we wanted to stay longer! We will definitely come back! We have already recommended Villa Silver to our friends. 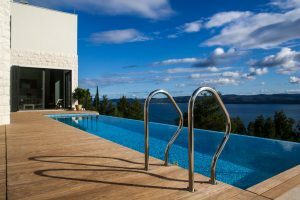 We stayed for one week in Villa Royal Hvar and it was more than we could ever imagine it would be. We had the best time on Hvar and will most definitely come back again. Villa Royal is amazing, it has terraces with the most beautiful views you will ever see. The pool is large and the pool terrace was where we spent most of our time. Villa was well equipped and the bedrooms were comfortable and clean. The surrounding area is peaceful and quiet as well as the beach close by. It is definitely what we were looking for. Zdravka organized a wonderful boat trip so we visited secret bays of Hvar and Palmizana and we also went to Bol on the island of Brac. Thank you for always being so supportive and kind! Our vacation was perfect thanks to you! We are so glad we met you! Thank you for all the support and the first class service you provided. Villa Kastela is the best villa in Split area and you are the best team in Croatia! We will surely contact you again when we decide to come back to your beautiful country! I was searching for the best place to stay with my family and friends and this is where I found it. You’ve helped me decide between so many choices and I must say – you did a wonderful job. Villa Infinity was perfect! Thank you for making it so easy and simple even though we thought it wasn’t going to happen. Hopefully we will come back again sometime.